The team from New Dawn Pools was asked to remove an existing outdoor pool and install a new 12m x 5m infinity edge pool with internal steps and Spa pool. 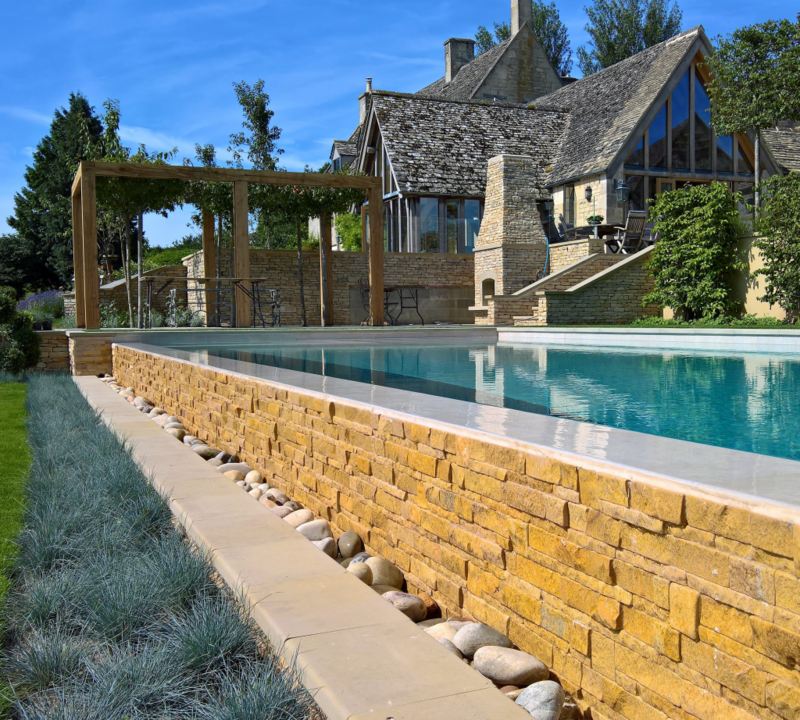 “We had to work very closely with a full garden design team and with the clients’ staff to create a pool of sheer luxury,” says New Dawn’s Richard Adams.“Our brief from the clients was to demolish an old existing outdoor mosaic pool,” he recalls. “This pool and the surrounding landscaping had to be completed, bya the end of June for their daughter’s wedding. They are absolutely thrilled with the end results, and have entertained very many people and the whole set up works (including the outdoor kitchen) and has a natural flow to the garden. Adds Richard: “The clients still wake up every morning take a look out of their bedroom window and pinch their selves as they can’t believe how amazing the pool area has fitted in to what is a stunning location.”New Dawn took on the project to design and build a new outdoor pool, with internal steps, internal Spa, infinity edge over looking one of the highest points in the Cotswolds, and state of the art lighting. The design and colour of the tiles was chosen to blend in with the Cotswold surroundings and lush green grass, give it very clean lines. The infinity edge with internal spa which took some working out with the controls, so that when the spa is in heating mode, the infinity edge stops flowing thus creating more rapid heat up.